Loopy Lou's Adventures Into Handicrafts: Oops, wrong neck! D has been wanting an aran jumper for some time. He chose James C Brett Denim with wool aran and chose a pattern from one I had here. It wasn't until I was doing the second side of the neck that I realised I had done the v neck version. D likes the round necks. Never mind, I think that's the perfect excuse to do him another one, with a round neck, but a different pattern. Hopefully, it will be as quick to knit up as this one was. Wow, that looks good. Be careful washing it though if it is the wool I sent you: cool and no tumble dryer...I forgot with a jumper I had made for me and it felted and very much shrunk!!!! 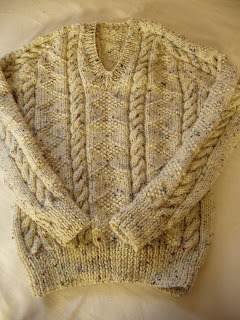 This is a very nice jumper and there is nothing really "wrong" with the neck. But of course everyone have own preferences. You must be a fast knitter. You and those turbo-charged needles! That's a gorgeous piece and it's hard for me to believe how quickly you make these things. Lucky kids! Oh, wow! That's gorgeous :) I'm sorry about the neck (I'm a v-neck person myself), but it sounds like you're up for another one! Looks very good. It's not a deep V, would he notice? I agree with Annie, you really must have turbo-charged needles! You whip these out so fast. I know, you've been doing this all your life but wow, you are quick! It's a great looking sweater. Wow - you're a fast knitter! Well done on the finish, I think it looks great with the V neck.